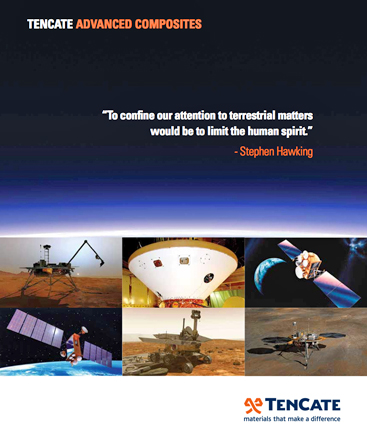 Direct link to the company's satellite + launch vehicle infobook. [SatNews] TenCate Advanced Composites congratulates SpaceX on their recent, successful launch of the upgraded version of the Falcon 9 rocket from Vandenberg Air Force Base in the USA. TenCate Advanced Composites in Morgan Hill, California, provided SpaceX with a wide range of advanced composite materials, including high temperature prepregs for spacecraft structures to bulk molding compounds used in compression molded components. This launch represented the maiden trip of an upgraded version of the Falcon 9 rocket with stretched fuel tanks, more powerful engines and a 5.2-meter payload fairing to enshroud satellites. Falcon 9 is a two-stage rocket designed and manufactured by SpaceX for the safe and reliable transport of satellites and the Dragon spacecraft into orbit. Falcon 9 made history in 2012 when Dragon rendezvoused with the International Space Station. SpaceX is the first commercial company ever to visit the space station and has made a total of three flights delivering and returning cargo for NASA.